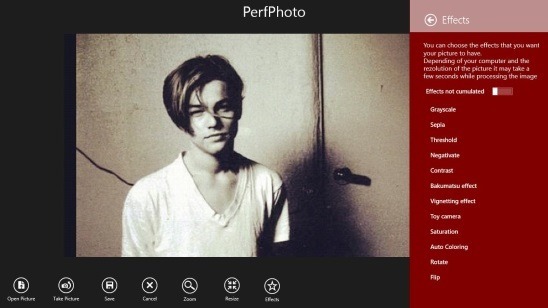 PerfPhoto is a free Windows 8 photo editor app. 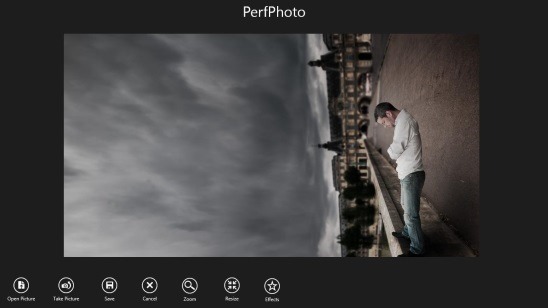 Using this free Windows 8 app you can edit your photos in few simple steps. You can edit the photos present on your hard disk, or connect a cam, take direct photos from the app, and finally edit them. The app consists of a nice set of photo effects that you can add over the photos. Besides that, you can easily crop down or resize photos. If you ever felt the need to put some good effects on your photos without using a fancy photo editing software or app then this is the app for you. You can easily download this free Windows 8 photo editor app from the Photo Category in Windows Store, or you can also use the Windows 8 Search Charm to download the app. This photo editor app for Windows 8 is pretty fast and totally functional. It is just one screen app, so there’s no hassle of jumping between different screens. All the tools are present at the bottom of the screen. The screen is pretty clean and there’s no Ad. This helps in putting all your concentration on editing the photos as there won’t be any disturbances. The buttons that you can use to edit photos includes: Open Pictures, Take Picture, Save, Cancel, Zoom, Resize, and Effects. You can either open a picture from your hard disk or take a picture through a cam and then edit it using this Windows 8 photo editor app. If you want to work with the photo present on your hard disk then, simply click on the Open button present at the bottom. If the photo is too big then you can click on Resize button. This opens a flyout at right side of the screen. Simply feed in the dimensions and you are done. In order to add effects, click on the Effects button. The various cool effects includes: Grayscale, Sepia, Threshold, Negativate, Contrast, Bakumatsu Effect, Vignetting Effect, Toy Camera, Saturation, Auto Color, Rotate, and Flip. One good thing here, is that some of the effects gives you a slider to work with. The sliders are always a good option because they give you more control over the effect, since you can always adjust the effect according to your wish. If you want to take a photo from your webcam, then simply click on the Take Picture button. The good thing that I liked here is: you can use a timer. This gives you enough time to get yourself settled. Besides that you’ll also get Camera Options button which consist options to change photo resolutions and sliders to change the Brightness, Exposure, and Contrast before taking a photo. If you aren’t satisfied then you can easily discard it by clicking on the Retake button. Once you are done you can save the photo in PNG, BMP, or JPG file format. Good Windows 8 photo editor app. Contains good set of effects. Change camera settings before taking photo. Similar free apps for Windows 8: Photogram and Fotor-Color Splash Studio. PerfPhoto is very handy. It comes with a straight purpose, and that is to allow users to quickly and easily apply different nice effects to photos and make them look good. 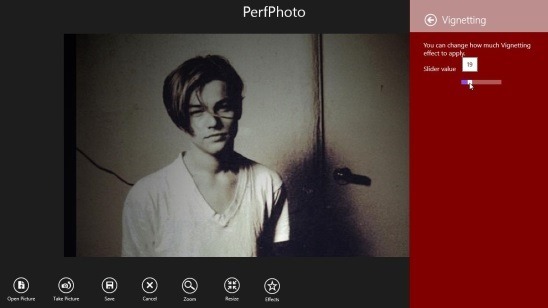 The biggest advantage of this free Windows 8 photo editor app is anyone can use it. There’s no rocket science involved to use it. Besides that it’s lightweight and totally functional. Though if some other features like sharing a photo and option to view photos within the app were included in the app, then it would have been more nice. Still, all in all it’s a pretty good free Windows 8 photo editor app. 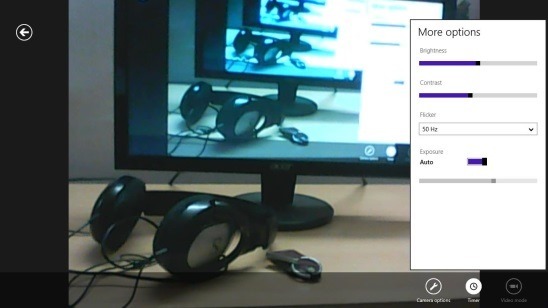 Also check out this free collage maker app for Windows 8: Memorylage.